We’re into Spring marathon season now, with Manchester this weekend (7th April), Brighton next weekend and I think there’s one in London that people hardly ever mention a couple of weeks after that. 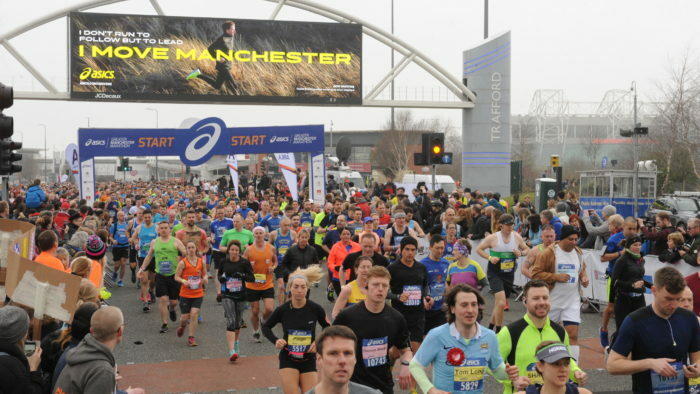 Here’s everything you need to know about the ASICS Greater Manchester Marathon this Sunday! 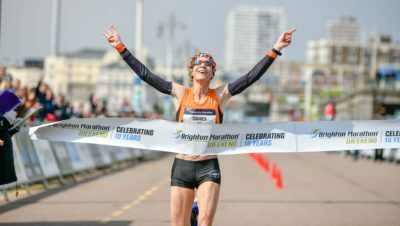 With a rich history dating back as far 1908, the annual event attracts big name elite runners right through to first-timers looking to notch up their first ever 26.2-miles at a major event. Numbers at the start line have grown significantly year on year, rising to one of Europe’s largest marathons in the space of just 12 months. As start lines go, it’s a pretty great location – Emirates Old Trafford. 20,000 runners are expected to toe the line this year. It’s also known as one of the flattest major UK marathons. And this has made it popular with runners looking for a PB. In fact more than 36% of entrants say they’re going for a PB this year. And as you’d expect from northerners, local support for the event has earned it a reputation as one of the friendliest marathons in the UK. Residents play music and stand out offering drinks and jelly babies to runners along the way. Manchester Marathon also strives to be an accessible and inclusive race, supporting runners of every level. 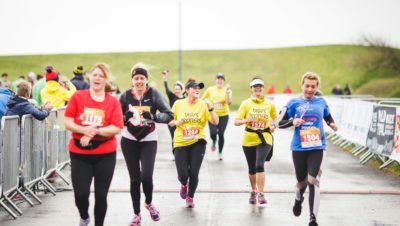 “While we’re excited to have some of Europe’s top elite runners taking part, we’re equally as proud of the first timers and recreational runners achieving incredible personal milestones out on our course. We can’t wait to celebrate with them all at the finish line on Sunday,” said Rusling. 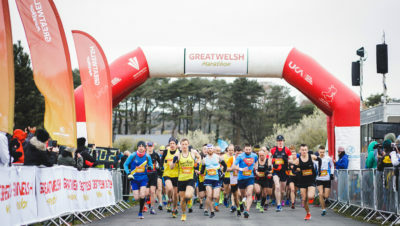 Hungarian runner Fanni Gyurko, Bristol and West’s Jenny Spink and Julie Briscoe of Wakefield are expected to lead the female field, while Matt Clowes of Cardiff is the favourite to take out the men’s elite race. This year, 15 wheelchair and 3 assisted runners have registered. Team Kerr, an assisted running team made up of (Dad) David, (Mum) Sandra and the main man (son) Aaron from Northern Ireland, will be lining up at the start line cheered on by their band of around 40 supporters making the trip with them. Stephan Couture and daughter Chloe of Warwickshire will be joining them in the assisted running field, racing a new custom-built wheelchair. Stephan sits on the Inclusivity Panel, a new initiative for the ASICS Greater Manchester Marathon aimed at making the event as open and accessible as possible. 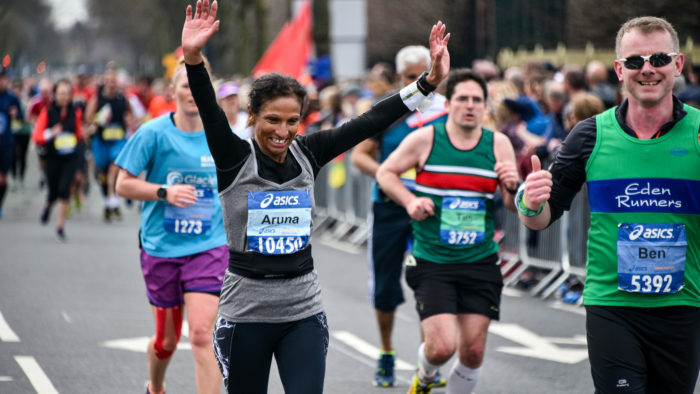 In addition to the personal achievement of crossing the finish line, many runners are also raising vital funds for official charity partners the Alzheimer’s Society, Cancer Research UK and The Christie and Royal Manchester Children’s Hospital. Organisers are also donating £1 from every entry to the Trafford Active Fund with the purpose of developing sport in the local area. Supporters who can’t make it on the day can tune into a live-stream of the event at 8:30am via the website at https://www.greatermanchestermarathon.com/ where they can follow the progress of their friends and family members taking part. Based at Lancashire Cricket Ground for friends and family, The Hangout will feature a stage and big screen where spectators can watch live coverage of the event. A DJ will be on set, along with a choir and prize giving. Title partner ASICS will be in the area along with three different food stalls and a bar, making this a great spot to relax whilst waiting for friends and loved ones taking part in the event. There is a strict capacity policy at this venue, and entry will be on a first come first served basis. Roads will be closed from 5am to 6pm to make way for runners on the day. Those making their way to the event are encouraged to use public transport where possible to avoid delays and traffic congestion. Organisers have identified the best places to watch the race are at Trafford Bar, Brooklands and Timperley Village. Find more information in the Spectator Booklet on the website at https://www.greatermanchestermarathon.com/. Find the 2019 route map HERE. Find the list of road closures HERE. Good luck to everybody running in the Greater Manchester Marathon!